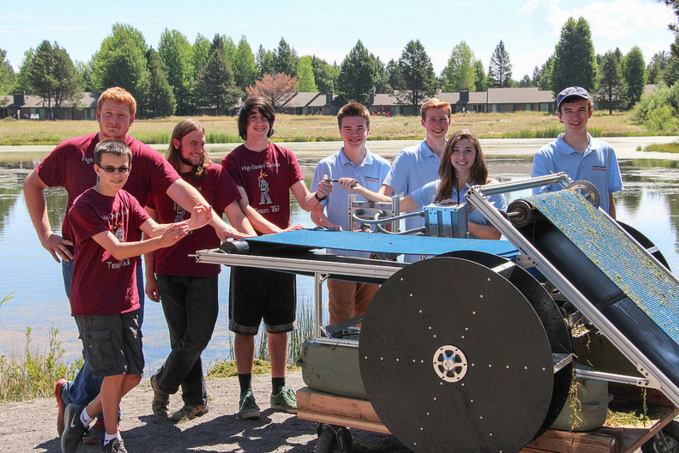 Catlin Gabel High School’s Global and Community Engineering Club’s invention is a low maintenance autonomous robot designed to skim and remove aquatic surface vegetation such as duckweed and algae from small lakes and ponds. This robot would offer a substantial reduction in the cost of removing the vegetation in comparison with the other methods of removal that currently exist. With this invention, we are able to serve a niche in the market for both small bodies of water and for bodies of water whose ecosystems are fragile or protected. Not only will our invention be useful where other technologies are not, it will also be substantially less expensive. For example, one of the current methods of removal would cost our target customer an estimated $100,000 to $200,000 for a single treatment lasting only a month. Contrarily, our target cost for our invention would be $30,000 (the cost of a team of three robots). Our invention would be the first in a new category of inexpensive environmentally friendly yet effective methods for removal of surface vegetation.